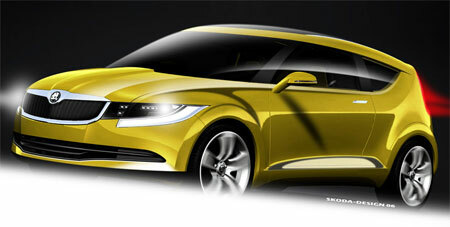 This is the Å koda Joyster Concept, Å koda’s vision for a new B-segment compact car that might make it into production as the new Å koda Fabia hatchback in the year 2007. The current Å koda Fabia is based on the Volkswagen Polo platform – watch out for a test drive report soon on the Fabia 1.4 hatch. Skoda is a company that has pretty much filled up the market segment where Volkswagen used to be – as Volkswagen has moved up a notch in the market, no longer concentrating on making cheap basic cars that everyone can afford. The Skoda Joyster Concept design study will be presented alongside other innovations from Å koda Auto at the Paris Motor Show on Thursday 28th September, 2006.